Where’s the Dignity and Respect? D I S G R A C E F U L!!!!! As if things weren’t bad enough….now there’s more….dead soldiers being delivered to Dover A.F.B. 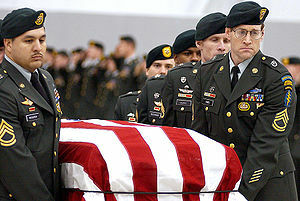 in flag-draped caskets by their comrades…and 26 families grieving…DEATH BENEFITS HELD HOSTAGE!!!!! …meanwhile the outrageous Dog and Pony Show continues at the Nation’s Capitol. Tears are about to break here…and they may…RIGHT AFTER OUR RAGE SUBSIDES…which, won’t be for some time…. WHAT THE HELL IS GOING ON HERE ????? This entry was posted on October 9, 2013 at 12:18 pm and is filed under bereavement, Cemetery, Death, Funeral, Government Shutdown, Grief, Life, Loss, Mourning, Patriot's Day, Thought For Today, Tragic death, Veterans, WWII with tags Afghanistan, Delaware, Dover, Dover Air Force Base, Government shutdown, Pentagon, United States, United States Department of Veterans Affairs. You can follow any responses to this entry through the RSS 2.0 feed. You can leave a response, or trackback from your own site. Thank you, Doggy. It is sad. It is an OUTRAGE. So happy to see you come by!